Image kindly provided by Marina; do not reproduce! To celebrate the season, a kind reader, Marina, has shared some of her photographs of Bavarian royal jewels. 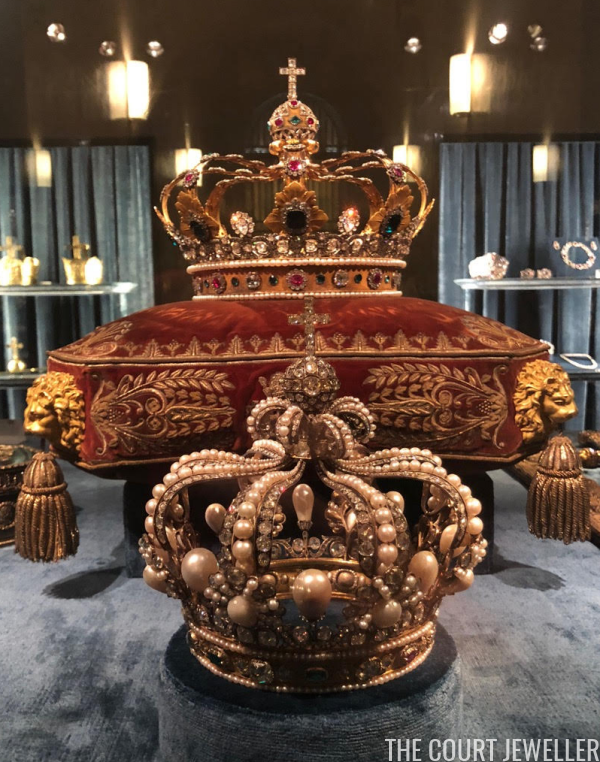 She recently visited the treasury room at the the Residenz Museum in Munich, and she very generously offered to share some of her sparkling photographs with all of us! 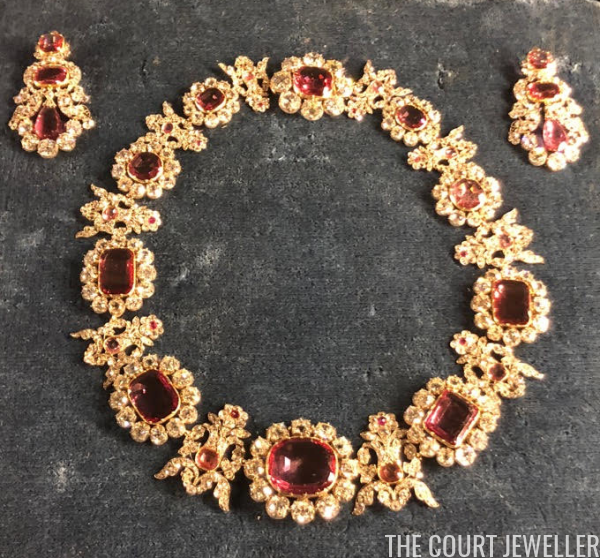 A large number of the jewels displayed in the treasury room, including both suites displayed above, belonged to Queen Therese, whose wedding launched the Oktoberfest tradition. 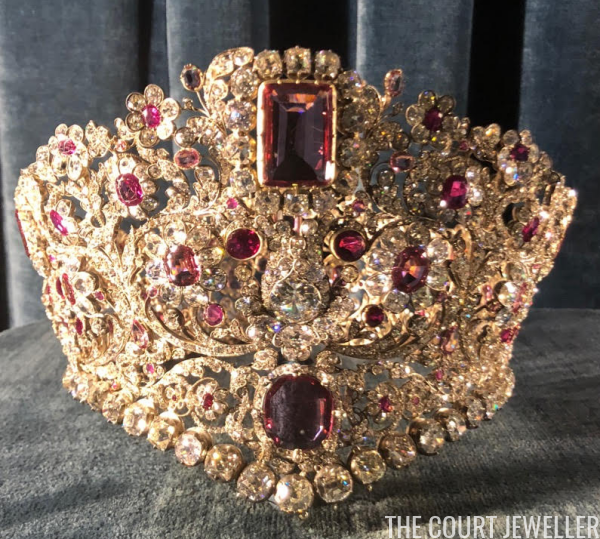 This massive diadem is part of the majestic Bavarian Ruby and Spinel Parure. 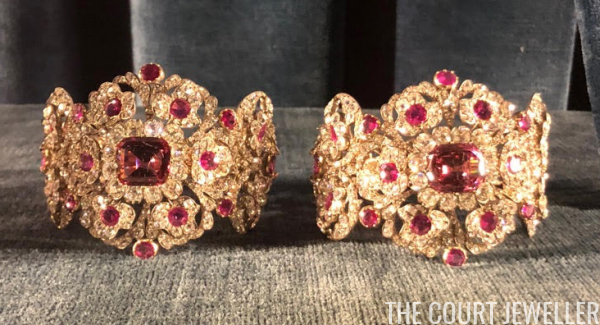 The suite was made for Queen Therese using gold set with diamonds, rubies, and spinels. 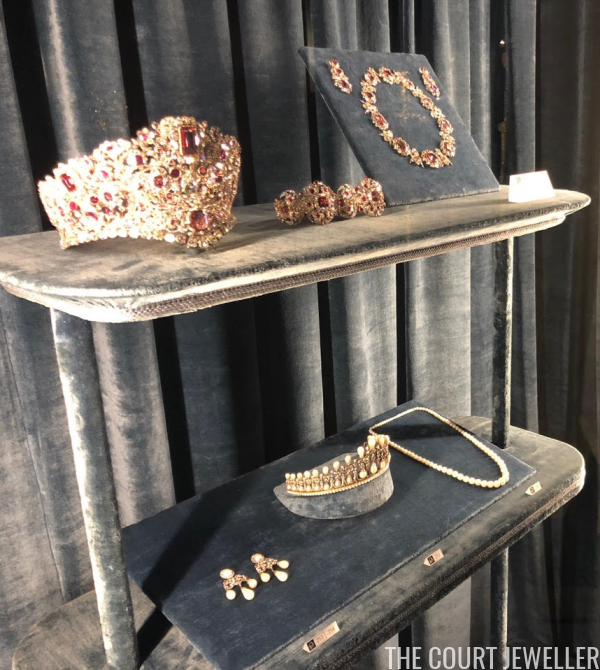 The set includes five major pieces: the diadem, a large necklace, a pair of earrings, and two matching bracelets. The elaborate necklace and earrings are pictured above. The gorgeous bracelets from the set rest nearby. 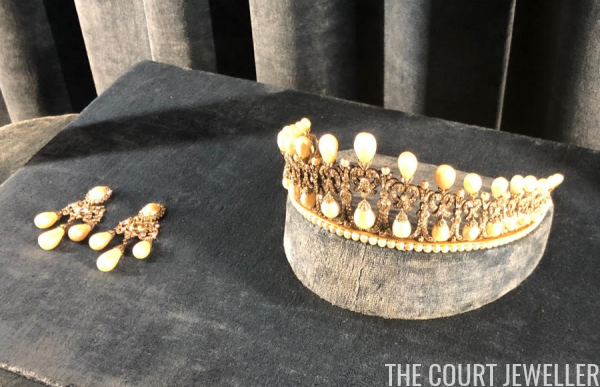 It's a little difficult to imagine what this set (especially the tiara) looks like when it's worn, so be sure to stop by our previous post on the suite to see a picture of Crown Princess Antonia of Bavaria wearing the parure. 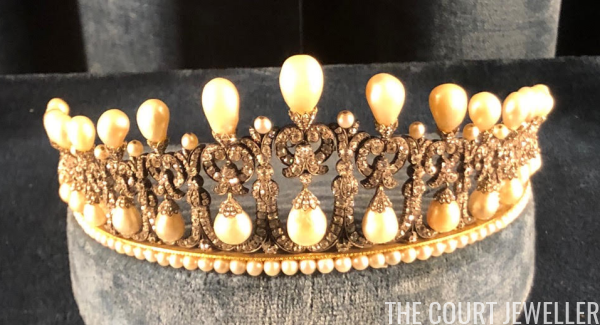 Queen Therese loved pearls, and her jewelry collection included a pearl and diamond tiara with a familiar design. This is the Bavarian Lover's Knot Tiara, which shares significant similarities with the Cambridge Lover's Knot Tiara and its copy, Queen Mary's Lover's Knot Tiara. The tiara was made for Queen Therese in 1825, the year she became queen, by Caspar Rieländer. 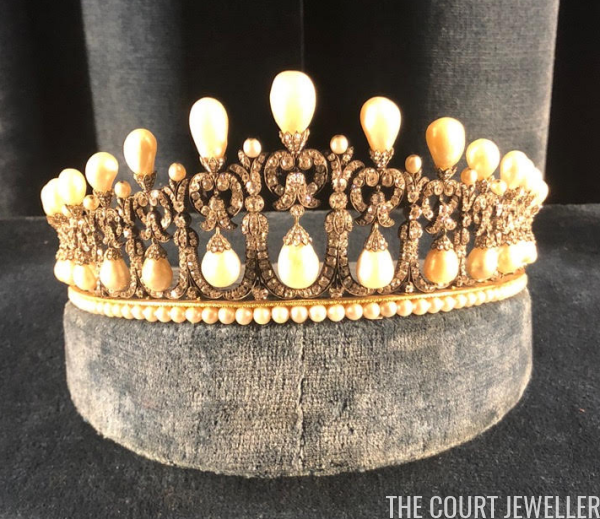 The tiara features an accompanying pair of diamond and pearl girandole earrings (pictured above) and a classic single-stranded pearl necklace. Queen Therese later gave the tiara to her daughter-in-law, Duchess Amalia of Oldenburg. Amalia was married to Therese's second son, Otto, who was elected King of Greece in 1832. King Otto I and Queen Amalia were deposed three decades later, and the tiara returned home with Amalia to Bavaria, where it has resided ever since. 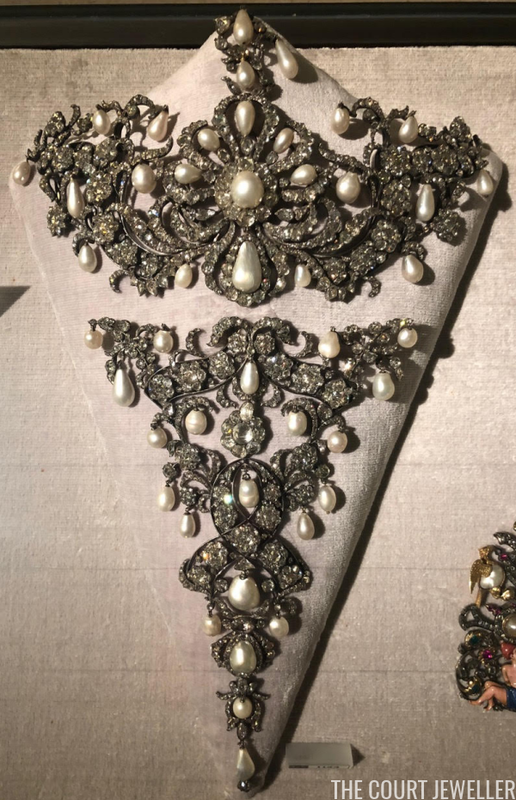 The display also includes an absolutely massive diamond and pearl stomacher (or devant de corsage). And finally, Marina has offered us a glimpse of two of Bavaria's gorgeous crown jewels. At the top of the image, sitting on the cushion, is the Crown of Bavaria, made in the first decade of the nineteenth century for King Maximilian I Joseph of Bavaria. 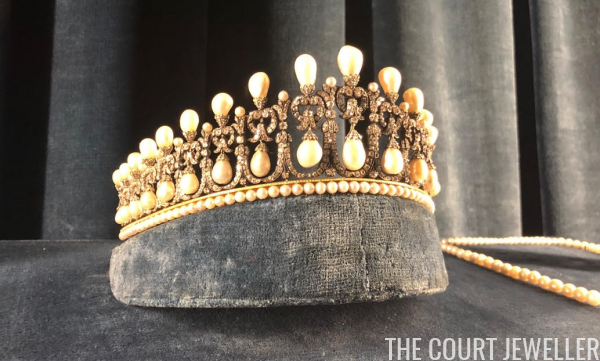 The crown, which was displayed at important ceremonies but never actually worn, is set with diamonds, pearls, rubies, emeralds, and sapphires. Below the Crown of Bavaria sits the Crown of the Queens of Bavaria, which was made for King Maximilian I Joseph's second wife, Queen Caroline. The crown is richly decorated with diamonds and pearls. Please join me in extending a huge round of thanks and applause to Marina for sharing her beautiful photographs with all of us!